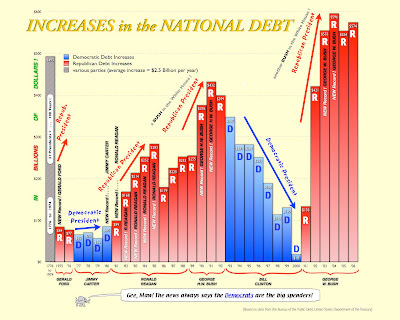 Who says Republicans are more fiscally conservative than Democrats? Judging from this chart, clearly they are not. But I still don't like Hillary and Obama makes me nervous. p.s. Where did I park my car? whats the diff if democrat or republican, they both spend your money,mcain is advertising for pfizer for ED, no wait..... huckabee,....,hmm, it is romney for cialis,no,no...its guiliani for viagra, thats not correct they all look important but all are impotent, thats it!!!!!!!!! !